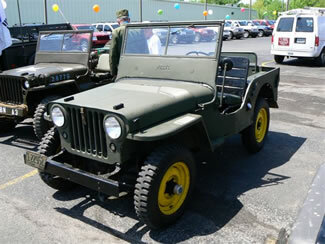 Kermit is Willys CJ2A #24007, it is a column shift with original motor. 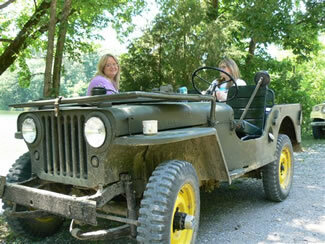 I had a friend who owned this Jeep before me, I use to see it sitting in his field at the rear of his property. One day I inquired about the Jeep and we worked out a deal. I could have it but I could not ever sell it. OK with me. Kermit as my children have named it was in very bad shape. It had a bent and rusted windshield with no glass, the tub was covered in rust and mud, the floor was gone, but it started after 7 years of sitting. I have replaced rims, windshield, tires, carburetor, generator, distributor, fuel pump, under dash coil and key combo (which I found in Minnesota), all the wiring, all the lights, brakes and master cylinder and wheel cylinders, etc. I and a friend rebuilt the engine and the rear differential. I found a column shift transmission and column shift parts at Walck's to replace the missing originals. I have put sheet metal in the floors and bought a repo back seat and painted it in flat OD green. The next step is a new tub, I want a replia Tub from Willys Overland. But I have to wait till the money shows up. In the mean time as you can see from the pictures, Kermit has fun. 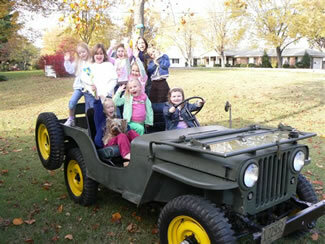 Any time I start the Jeep I usually have kids crawling in for a ride. 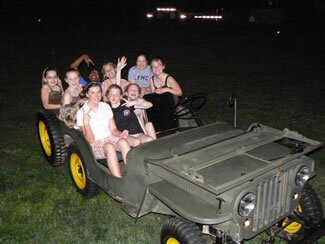 Birthday parties at my house always include a Jeep ride. Kermit is no fair weather Primadonna, He has taken on the trials at Land Between the Lakes and a few trail rides with our Middle Tennessee Vintage Willys Club. Kermit the Jeep has a new friend, I recently found a Bantam trailer to pull behind him. One day he will be restored and retired to parties, shows and parades, but until then, we play with the big boys.